A man has died in a single vehicle crash on Shooting Butts Road in Martinborough this morning, police said. Police have released name of the man killed in a vehicle crash in Te Kuiti on Monday night. He was 22-year-old Phil Thom from Benneydale. 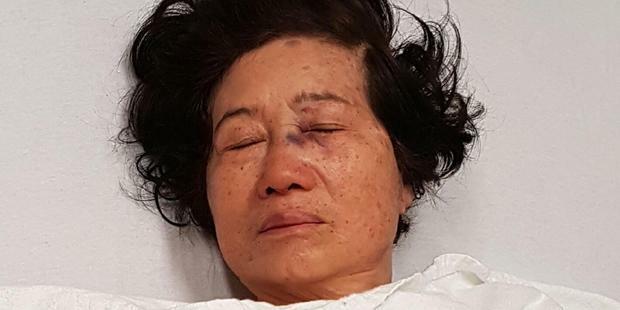 65-year-old Nancy Voon was beaten up by two teenage girls outside the Panmure YMCA in broad daylight last week. She was dragged from her car in Panmure last week and bashed – suffering concussion, a broken bone in her face, chipped teeth and bruises. Thanks to the frigging postie of the month, more than three thousand items, and over 667 voting packs, did not reach their intended target. What else is there to talk about in this God-awful land? The family of Leslie Putt, who was fatally shot in Manurewa have asked for privacy at this time. A motorcyclist was killed near the intersection of Rehi Road and Whirinaki Valley Road, Ngakuru, south of Rotorua. The fatal crash occurred between a car and a motorcycle at 5:15pm this evening, police said. Police say they are “investigating” two [unrelated] serious assaults which occurred overnight. A body found in a bush south-east of Kaitaia on Thursday has been confirmed as that of 48-year-old Waipapakauri man Kimble Moore, who was reported missing on March 18. Police named Scott Robert Truger, 43, as the man who was killed when the car he was driving collided with a truck on State Highway 1, north of Waikanae, on Friday. Truger’s son Konrad, who was born in a car then also killed in a crash, aged just four in January 2008. 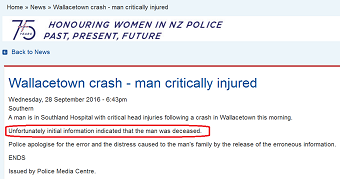 Sent by a reader in NZ’s Murder Capital [aka, “Auckland”] —edited by Moderator D.
The [reported] fatalities include [yet another] motorcyclist killed in police pursuit in Auckland. The motorcyclist was killed after crashing into a parked car at the Royal Oak Roundabout, Mt Albert during police pursuit. In addition to the [known] fatalities, about a dozen others have received critical/serious injuries on the roads today. The [reported] fatalities occurred in Auckland (1 person killed during police chase), Warkworth (1), Northland (2), Waiouru (1), and Taranaki (1). 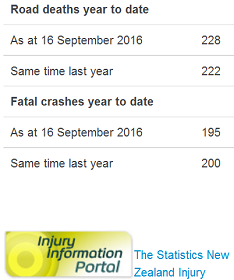 About 900 people are killed on NZ roads each year. 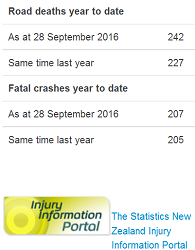 [Most probably] about 670 road fatalities have occurred in NZ since 1 January 2016, but only 233 reported by police/minitru. Could police charge the irate French tourist with triggering Christchurch quake and committing mass murder? 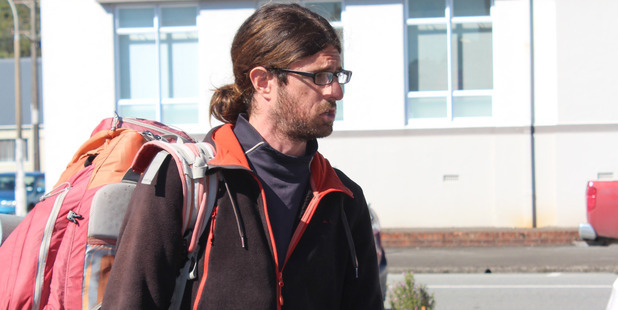 The irate French hitchhiker accused of destroying a West Coast road sign out of frustration has now been charged with the theft of a sleeping bag in Auckland. He has since been spoken to by police and is to reappear in court, according to the media. The hitchhiker, who’s apparently visited 72 other countries, says his anger boiled over after he was racially abused while trying to thumb a lift, according to a “plain-clothed policeman” who gave him a lift. “It’s originated from a dispute with people on the roadside who made comments about his odd behaviour long before he throw stones at the sign. He wanted a ride. They said no. It escalated. They told him to catch the bus and he was told ‘why don’t you f… off back to where you came from’,” said the “mystery motorist” who picked him up after his first court appearance. Let’s hope the spiteful authorities will abstain from charging him with triggering the Christchurch earthquake and committing mass murder. “Radiation in New Zealand food is not from Fukushima” ? “Two post-Fukushima meltdown studies [conducted by the government] have found radiation in New Zealand food: but fear not – it is merely harmless remains [REALLY?] from nuclear testing decades ago. “After the 2011 Japanese earthquake and tsunami, which caused a meltdown of the Fukushima Daiichi nuclear power plant, New Zealand’s Ministry for Primary Industries [MPI] commissioned two studies to look at radiation making its way into the New Zealand diet. “Not only were the elements expected to be found in Fukushima fallout not present, but modelling showed it would be about 10 years before it reached New Zealand – and by then it would not be at harmful levels,” MPI mouthpiece said. “A patient is in intensive care in Wellington Hospital with Guillain Barre Syndrome – the debilitating condition linked to campylobacter outbreaks such as the one that hit Havelock North. 24-year-old Tejas Patel was hit and killed by a train at Auckland’s Morningside station. And in the old kiwi tradition the authorities, Transport Accident Investigation Commission,blame him, the victim, for the fatal collision. Police say they have recovered a body from a rural bush area 20 minutes east of Kaitaia. And … that they have been searching in the area since yesterday using cadaver dogs and a specialist search unit from Auckland. Kyung Yup Kim, 41, who spent his 40th birthday in custody in 2015, has been held in custody without a charge for more than five years while the extradition process continued. Kim, who has two teenage children, has repeatedly denied meeting the woman who was killed in Shanghai or having anything to do with her death in December 2009. Kim’s lawyers said there was “overwhelming credible evidence of routine use of torture and ill-treatment” in China, particularly to extract confessions. A fatal crash between a car and truck on State Highway One in Huntly occurred a short time ago. An unidentified woman was killed after being struck by a train in Christchurch this morning. The incident occurred at the rail crossing at the intersection of Main South and Kirk Roads in Templeton. Five people are in Middlemore Hospital following a two-car crash in Papakura this morning. A newborn baby and an 8-year-old child with serious injuries were among the victims. Single mum April Singh, 41, has been diagnosed with Guillain Barre syndrome, a serious neurological disorder, after contracting campylobacteriosis from drinking infected tap water during Havelock North’s gastro outbreak in August. Guillain Barre Syndrome (GBS) can develop after a campylobacter infection. “I’ve gone from being a real strong person to being a weakling,” she said. Singh, who was in considerable pain, was misdiagnosed at the Hastings medical centre on September 3. “She was told there that she may have fibromyalgia and she went home. Five days later, when things hadn’t improved, she went to her GP, who sent her to hospital,” said a report. At least 111 people [2.32 per 100,000 people] with GBS are hospitalized in New Zealand each year and a third of of them are related to campylobacter. Nikolas James Posa Delegat, 19, the son of winemaker Jim Delegat – estimated to be worth $450 million by the National Business Review – was sentenced to 300 hours’ community service and ordered to pay $5000 following a “serious violent attack” on a female police officer. 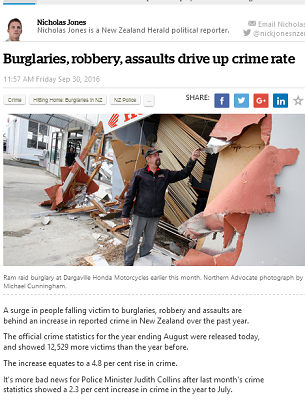 Thanks to the apartheid system, Maori are twice as likely to go to jail than Pakeha when convicted of assault.